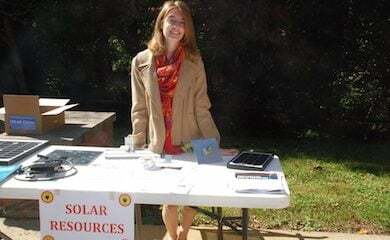 Solar streetlight shines light on public park in Charleston. In 2016, residents of Charleston’s Fort Hill neighborhood became concerned about increasing levels of litter and nighttime loitering at a local park. The park preserves the site of Fort Scammon, a Civil War fort with earthen battlements from 1873 that has been listed on the National Register of Historic Places since 1976. The City of Charleston acquired the property in 1977 and established a small public park there. After local resident and neighborhood watch member Rod Watkins heard his neighbors’ concerns about what was happening at the park, he approached his local Charleston City Council representative to request the installation of a streetlight there. The City Councilperson suggested that Watkins circulate a petition to his neighbors to demonstrate local support for the idea. According to Watkins, the Charleston City Council then consulted a lighting professional, who declared the installation of a streetlight to be unfeasible at that location due to the necessity of clearing 500 linear feet of right-of-way to deliver grid power. 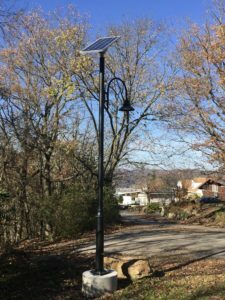 But Watkins wasn’t ready to give up on the idea and presented the council with a better, more cost-effective solution: a solar powered streetlight. Watkins had once noticed a solar-powered light at Antietam National Battleground, so he knew such fixtures existed that would complement the Fort’s historic setting. Watkins took matters into his own hands by soliciting quotes from several companies that specialize in solar outdoor lighting, and presented what he deemed to be the best option to the City Council. In December 2016, the City of Charleston agreed to purchase and install the solar-powered streetlight that Watkins had recommended. The fixture was installed in May of 2017, and Watkins reports that it works perfectly and has helped reduce the issues of litter and after-hours loitering at the park.